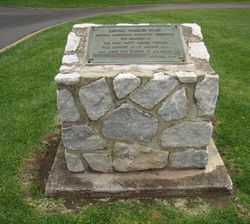 The monument commemorates the centenary of Captain Charles Sturt and the members of the Central Australian Exploring Expedition of 1844. On August 10, 1844, Sturt's carefully selected and well-equipped expedition set out from Adelaide to explore the hitherto unknown interior of Australia. This year places along the route from Adelaide to beyond the Queensland border are planning to commemorate the centenary of that great expedition, and to honor the memory of the first white men to pass their district. The president of the S.A. branch of the Royal Geographical Society (Mr. Hambidge), accompanied by Mrs. Hambidge and a number of fellow members, will leave Adelaide on a pilgrimage to participate in the unveiling ceremonies between Gawler and Renmark. The places visited will be: Gawler, Daveyston, Light Pass, Nuriootpa, Truro, Angaston, Koonunga, Morgan, Barmera and Renmark. Barrier Miner (Broken Hill, NSW), 11 August 1944.